Toasty toes are key for winter. Everyone wears socks, why not wear fashionable and warmly welcoming socks? I agree that the white tube socks have their place in the gym or for rolling around curlers but they are not for everyday. Make a statement with your feet and help us show off our newest product. 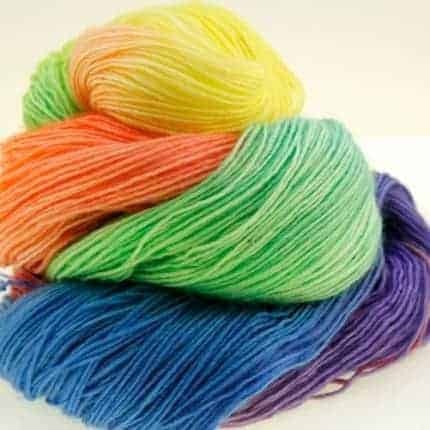 Gradient double knit sock blank! 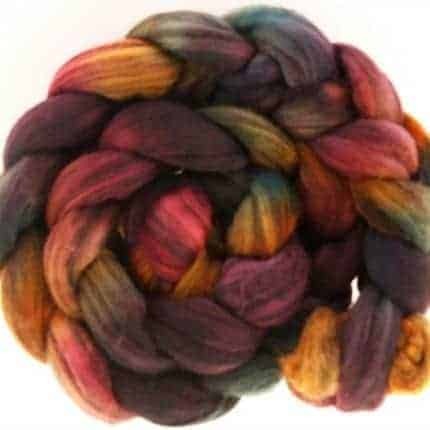 All of the luscious colors from our gradient minis skeins spread over an easy to use blank. These are the coolest things to make two identical socks. 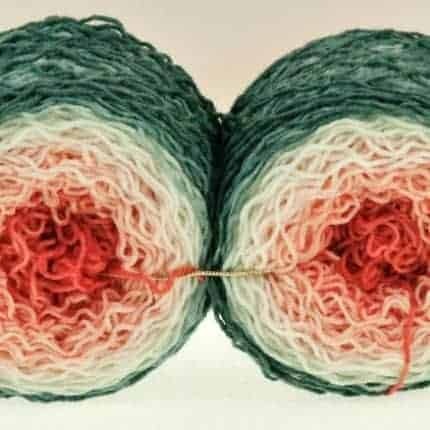 A blank is yarn that has been knit into a long rectangle of one layer. 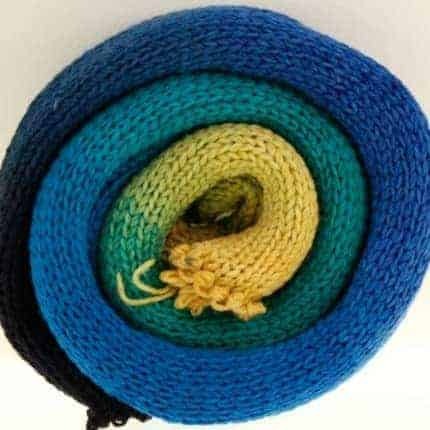 The blank unravels from one end easily and you can knit directly from the blank. 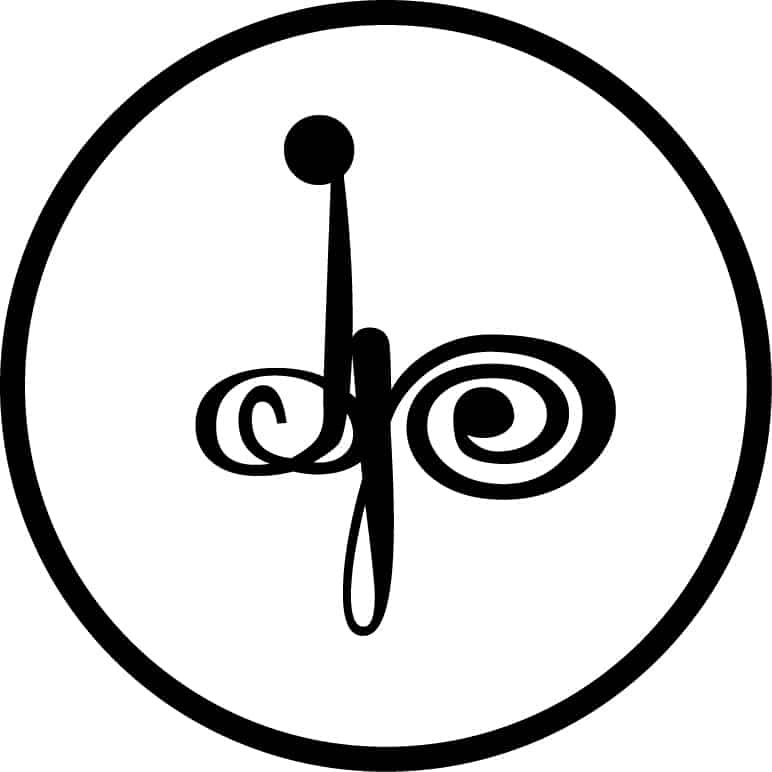 Or, wind a center-pull ball for a more traditional approach. The “right” end will unravel smoothly; the “wrong” end has a lockstitch at both edges. 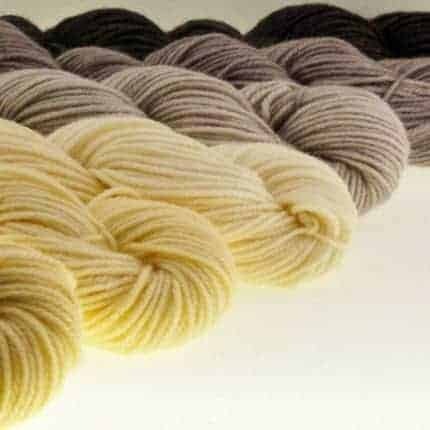 These blanks have been dyed with the a subtle transition from one shade to the next kept in mind. 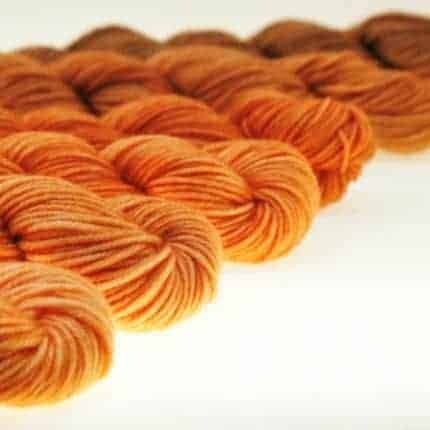 This color change occurs once across the entire skein and will have a soft heathered appearance when knit. 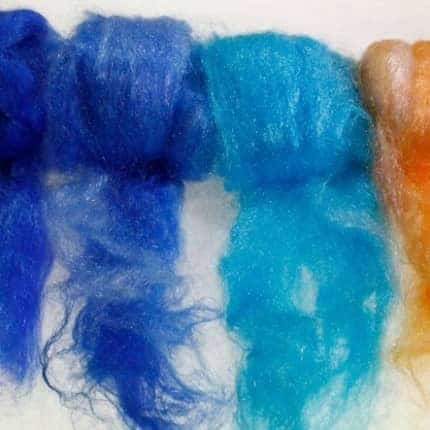 Keep an eye out, many more colors are on the way! Phew, so glad that is over. The Holidays around here are NUTS! 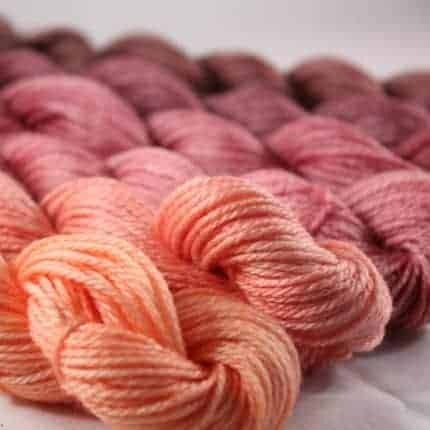 Now that the eating, drinking, traveling and shopping are done I can relax in the Studio and cook up some lovely new gradients. Jenn and I have been watching Outlander recently. She is watching for the cool knitwear that Claire wears and I watch because Jamie is HOT, umm I mean because I get inspired. This what I’ve come up with so far. 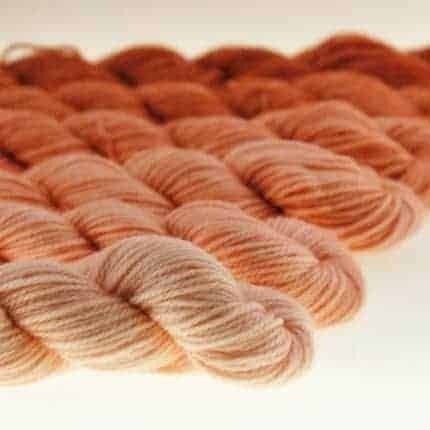 Claire is a subtle copper gradient, Jamie is a smoky gray. 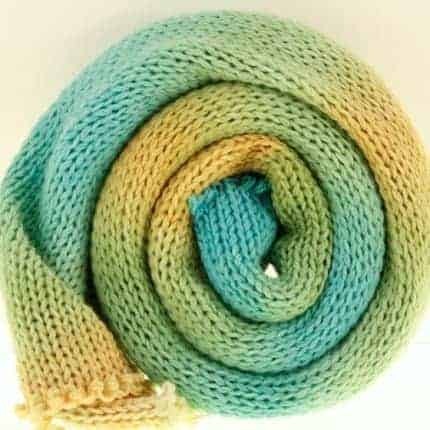 Use them for shawls scarves or socks. 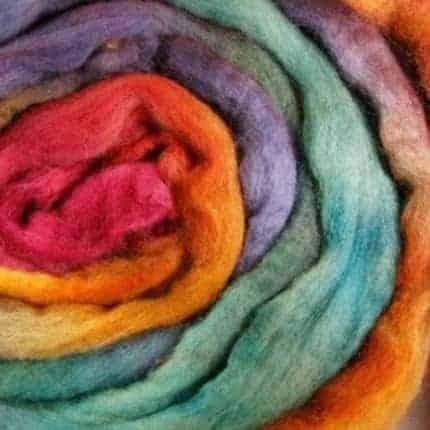 We’ve designed a “Noro-esque” Spin to Knit Scarf Kit for fiber lovers that mix Claire and Jamie and keep you warm without the itchies. Stop by the shop for more new colorways, and don’t forget custom orders are always welcome. 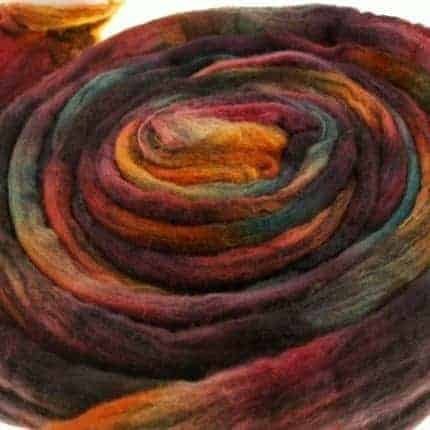 It’s finally fall, leaves are changing, there is a crispness in the air, kids are back to school and June Pryce has added a new product to its already overflowing shop. 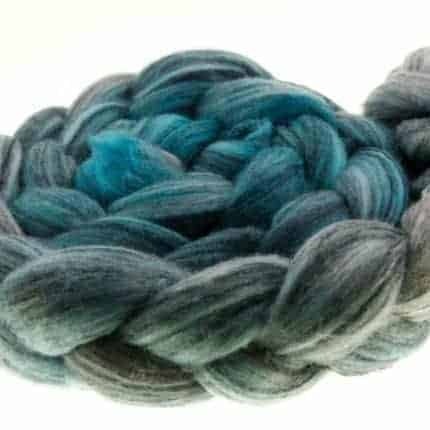 Beavertail is a lovely 3-ply DK weight yarn of 85% Polwarth wool and 15% Silk. It has a wonderful hand, great stitch definition and is soft enough for next to the skin projects. 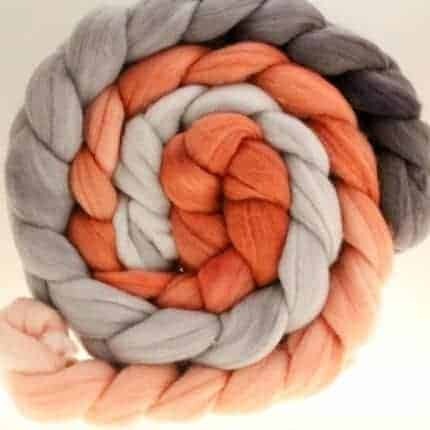 While the shop has offered this DK base in full sized skeins, the Dyenamic Dyestress has decided that sock weight lovers should not get all of the fun and has begun dyeing the Beavertail into mini skein sets of its own — 600 yards (100 yards per mini) of gloriously colored sets. Looking for ombre? 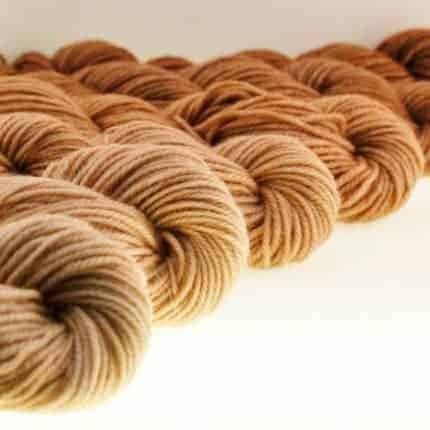 No problem, check out “A Latte to Espresso” a gradient dye of warm browns. Need color? Great! 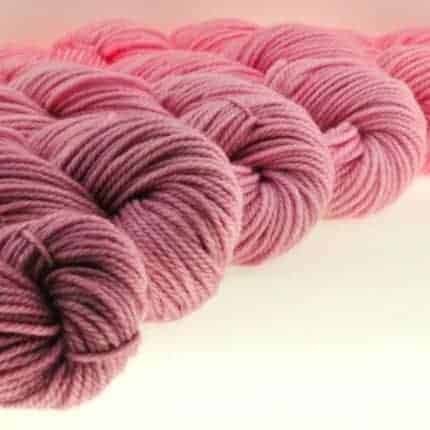 Try “Plum Orchid,” a comprehensive set starting at a medium pink and ending in a ripe plum. Crisp air needs crisp colors? 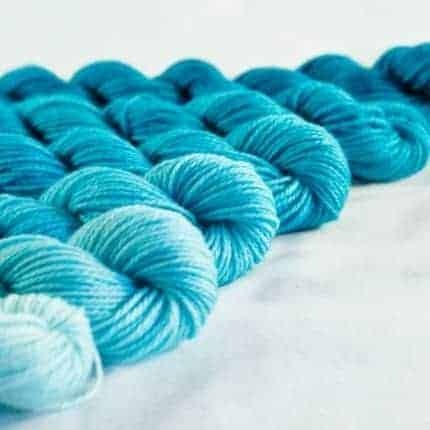 How about “Arctic Ice?” It’s a cool gradient of dark cerulean that slowly gets paler until it ends in just a whisper of crisp color. 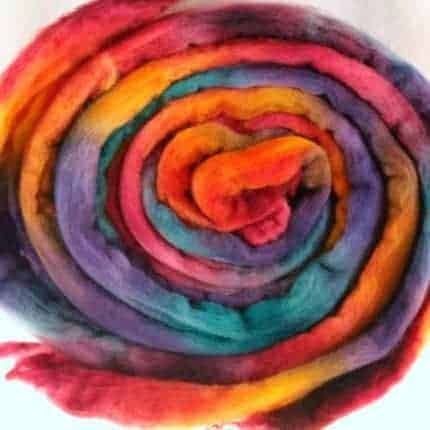 No matter what you are looking for you will find it with June Pryce Fiber Arts. 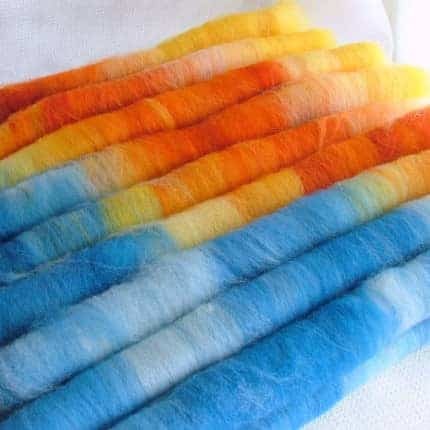 They will feed your fiber (or yarn) fetish! It’s getting on to the cooler weather here on the East Coast and it is beginning to show in our products. 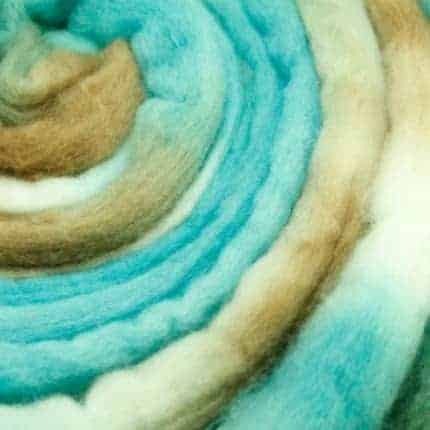 The time is now to begin to think about our fall/winter spinning projects. 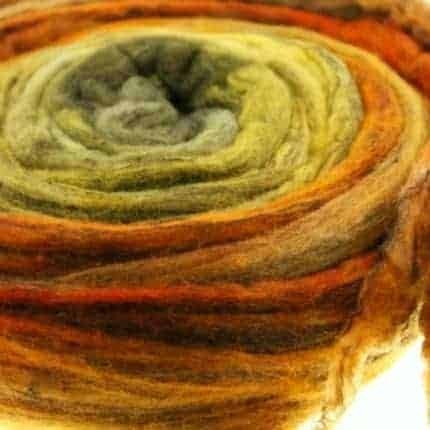 While the elements may be nasty and blowing outside you can sit in your warm, comfy home spinning up dream yarns. To help with that we have a new base at June Pryce. 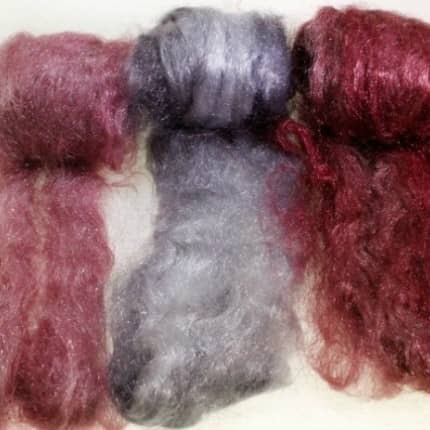 It is a lovely 80% ecru Merino and 20% black Tussah silk. 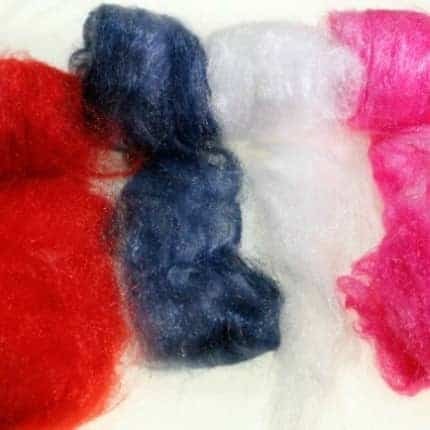 This stuff is gorgeous soft and silky. 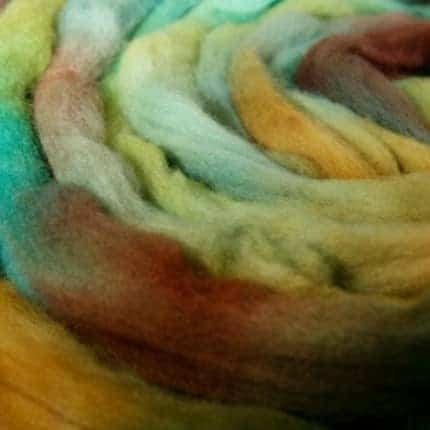 It will spin up both a worsted or a woolen yarn to “dye” for. 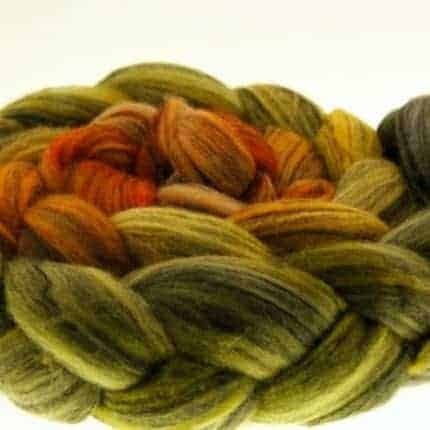 The two tone base adds a depth and richness to the colorway that you can not get with dye alone. 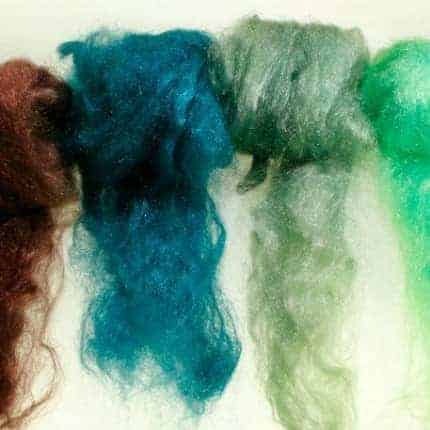 We have tested out this new base on three of our favorite shop colorways to a great response. 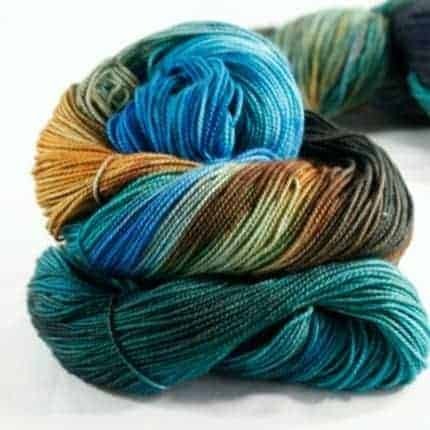 Keep an eye out for more exciting colorways on this fantastic base. We’ve added some bling to the shop!! 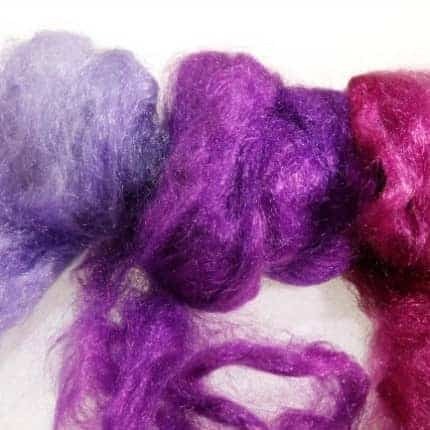 100% nylon Firestar is ideal for blending with other fibers to add a little sparkle and strength to your spinning projects, such as in sock heels and toes. 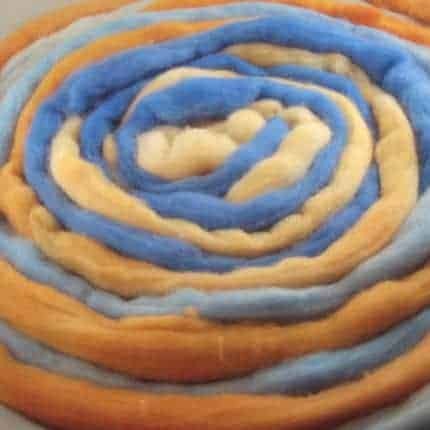 It can also be spun alone! 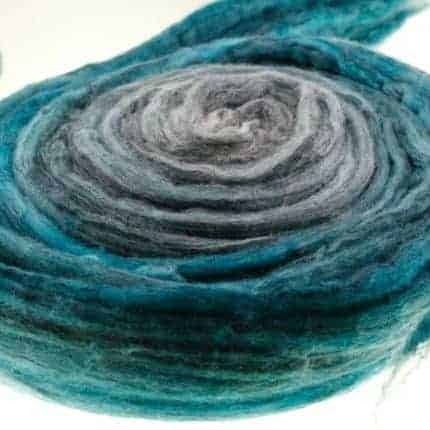 It can be carded to blend, added to batts or spun and plied with another strand of wool, etc. 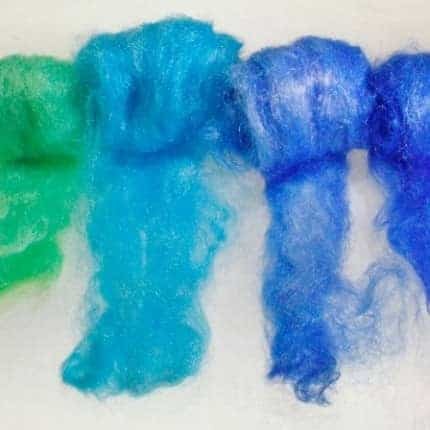 While nylon will not felt by itself, you can add a bit to your felting projects to get that needed shine. Pretty and versatile, who knew? 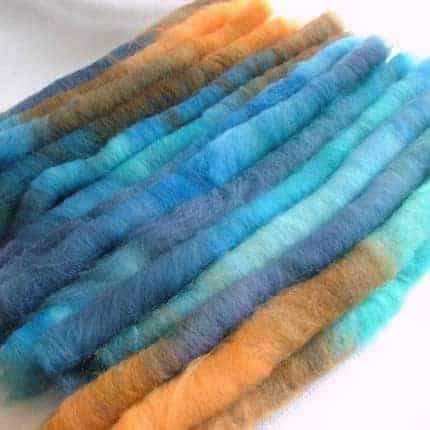 We have put together mixed batches of Firestar to allow for more creative freedom. Are you a Diva? Cowgirl? Nature Lover? Surfer? We have a set for you! Stop by and take a look. Check out the newest addition to the June Pryce line! 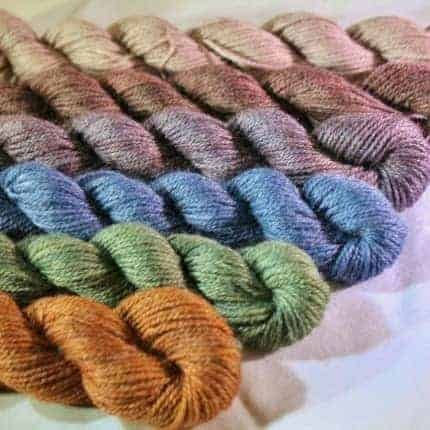 Rolags! 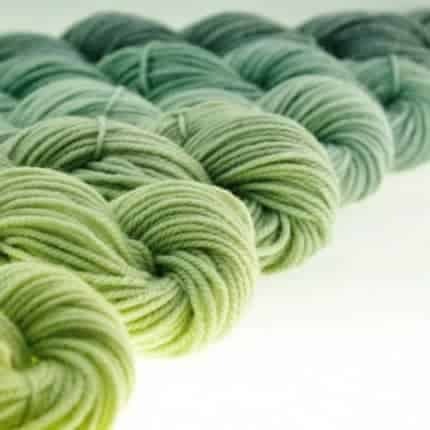 Jenn is taking our favorite fiber colorways and whipping them into sweet rolags. 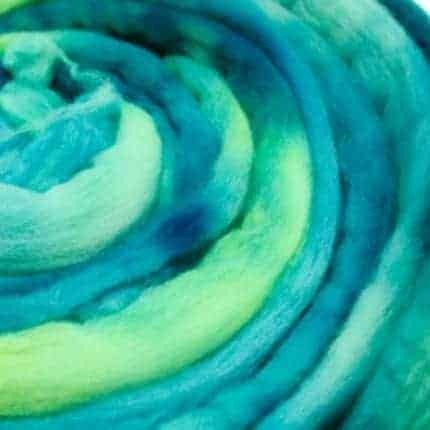 Beautifully soft and smooth, ready to be spun up into a gorgeous yarn. Don’t see them in your favorite June Pryce colorway? She will gladly card some up custom for you. Keep an eye out, more fibery goodness to come! 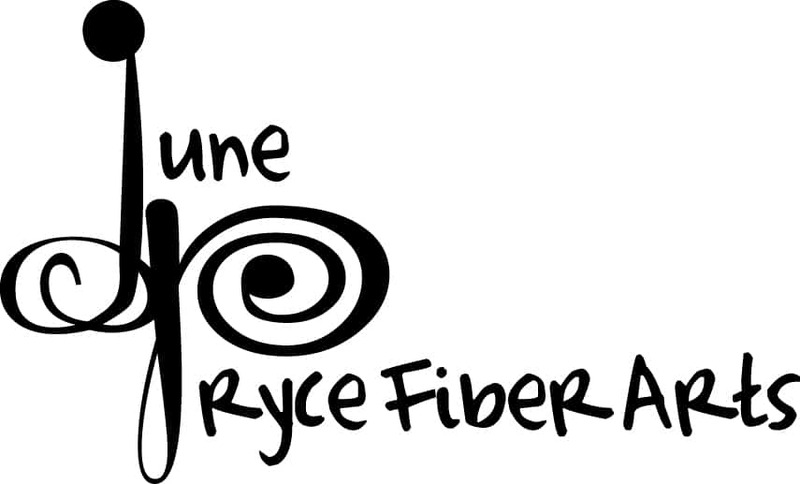 June Pryce Fiber Arts is a sister-run company specializing in supplies for the creative crafter. Cheryl is based in Rhode Island and Jenn in Pennsylvania. 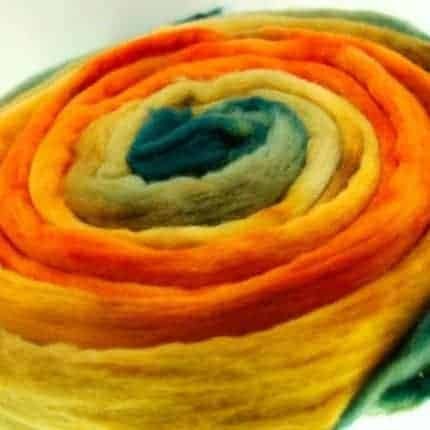 Visit their Etsy shop for a mind-boggling array of color and texture: Spinning and felting fibers, hand-dyed yarns and handspun yarns, project bags and the unique shawl pin alternative, the Knit Link. 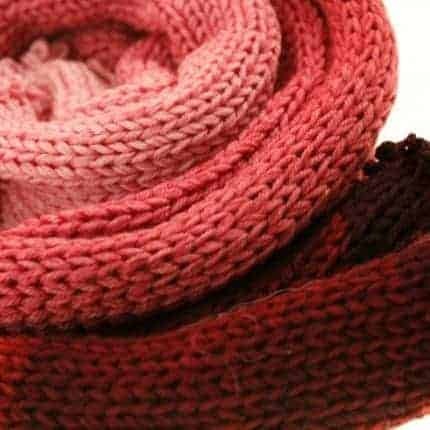 Original knitwear designs coming soon! Custom orders joyfully fulfilled. Their Spin to Knit Scarf Kits have been featured in Spin-Off Magazine and you can see their newest ad in the awesome Ply Magazine. It is usual for the shop to be updated and rearranged on Tuesdays to keep it fresh. 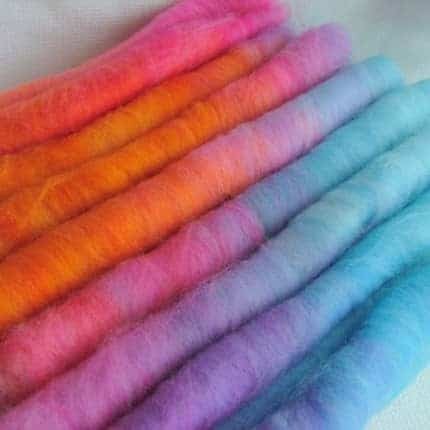 Right now, Cheryl is hording everything she dyes for their upcoming shows. 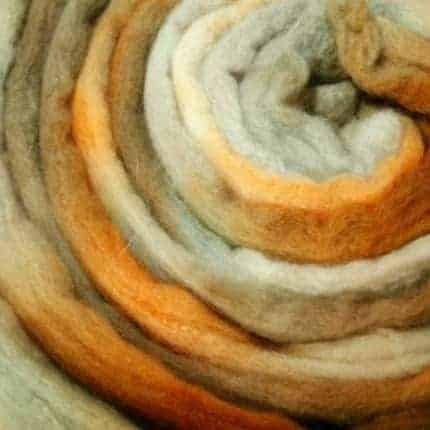 Visit them on May 17 in Bristol, Rhode Island for the Rhode Island Wool and Fiber Festival and on May 23 and 24 in Cummington, Mass. at the Massachusetts Sheep and Woolcraft Fair. 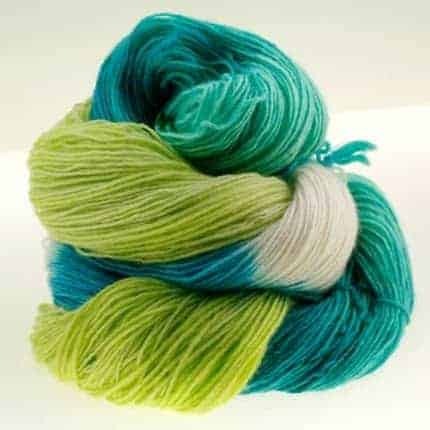 Please join them over on Ravelry in their June Pryce Fiber Arts group for more information on shop updates, clubs, KALs, and other fun stuff.